A Washington appellate court recently disqualified a county prosecutor’s entire office from participating in the re-trial of a murder case. The chief prosecutor had previously represented the defendant while in private practice. The case shines a light on government lawyers and imputed conflicts of interest. You can’t interview potential expert witnesses and share confidential information with them solely to taint them with a conflict that would prevent the experts from working for the other side, the Texas State Bar Professional Ethics Committee recently said in Opinion No. 676. 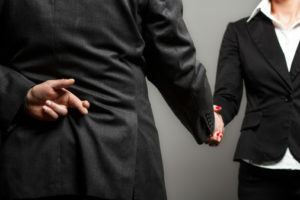 Representing a campus sexual assault victim-turned-activist and later using her confidential information in representing an alleged campus assailant with interests adverse to the former client is a “textbook” conflict of interest. That’s the message the Pennsylvania Supreme Court sent in suspending a lawyer for a year in a consent-to-discipline case published this week. The Law for Lawyers Today is a resource for law firms, law departments and lawyers needing information to meet the challenge of practicing ethically and responsibly. Here you’ll find timely updates on legal ethics, the “law of lawyering,” risk management and legal malpractice, running your legal business— and more.